Altaro is a backup vendor who became famous as was one of the first Hyper-V backup supporters. Not only that, it’s Hyper-V support exclusive. The product was so good that even Microsoft start using it. Some other known companies using at are Seiko, Peugeot, Harvard Unversity, Xerox, University of Miami, University of Delaware and many others. When the product evolved, they slowly added features, among which was support for VMware. In a couple of years, the product grew rapidly. When I tested version 7, I was impressed by the performance and the features. You see, having a great product is not enough. When you have a great product which works reliably, has the right set of features AND has a good price policy, you have a winner. Altaro became so successful because the pricing is one of the best. In the latest version, Altaro introduced GFS archiving making now possible to archive backup versions rather than deleting them. Now you can set up an excellent backup policy where Altaro VM backup keeps backups from the time of the last successful backup of 1 backup per week for 12 weeks, one backup per month for the previous 12 months and one backup per year for the last two years. Change Block Tracking makes incremental backups really fast as it does have to scan the entire VM each time for the changes. CBT can decrease backup duration from hours to minutes. CBT improvements in Altaro 7.6 compared to version 7 improve CBT when Hyper-V agents are updated when Altaro VM backup or its agents are restarted, when Hyper-V host is rebooted or when VM on a failover cluster migrates between the nodes. One of the important updates in this version is definitely parallel Backup and Restore Operations. In the previous version, one operation like an Offsite copy to Azure could queue backup operations until the job completes. In version 7.6, users can restore and take Offsite Copies without the delay of any scheduled backup or CDP operations. Altaro keeps improving slowly but steadily. Let me remind you about some impressive features you can expect from Altaro VM Backup. 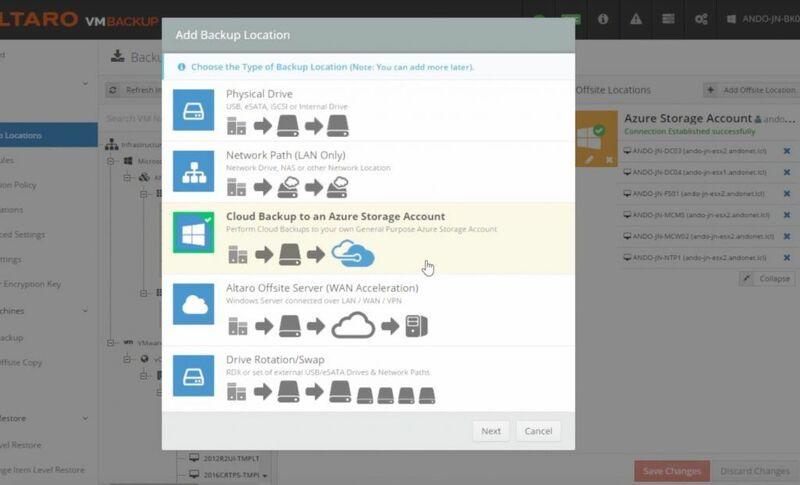 Backup to Azure is one of the best features. With monthly fees, affordable pricing you can add secondary/safe location in an instant, all without major investment. Azure BLOB storage is supported which is the most cost-effective Azure Storage option. Altaro Cloud Management Console is a neat web-based console which is available in two editions. MSP edition enables IT Resellers, MSPs, and VARs to manage and monitor all of the customer’s backups centrally. CMC End user edition is available as part of the Unlimited Plus edition and enables Altaro Backup users to leverage simplicity of Altaro Cloud Management Console for their VM backup installations, across single or multiple sites. Augmented Inline Deduplication is one of the best deduplication implementations in the industry. It enables backups to have the smallest size. Also, it creates the smallest backup size compared to other vendors. Backups are faster and have fewer data to transfer which make it perfect for WAN locations. 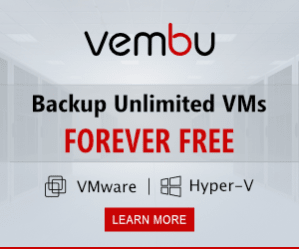 The more VM backups the better, efficiency increases as more backups are added. Altaro users will be happy as they will see huge savings in the storage area. Simplicity and ease of use was an essential factor for Altaro developers when they redesigned and created on the best and easy to use program interface. When a disaster strikes, you have to be operational as soon as possible. That is possible with a feature called Boot from Backup. Let’s say that your Exchange server fails. Instead of performing a full blown restore and wait like a whole day for restore, you can boot directly from a backup and save the day. What is even better is that when you boot from backup in Recovery Mode, it will automatically start a restore operation in the background when the VM is booted. That means that you don’t need to perform restore later on. 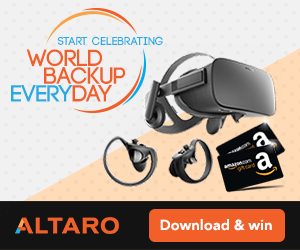 You can get more information on Altaro website or even better, why not give Altaro VM backup a try – its free for 30 days.